After I wrote the post about the old chinese movies that used to babysit me when I was a little girl, I couldn’t get the tune of one of the songs in the movie “Mountain Song” out of my head. Yes, even after over 25+ years, I can still remember the tune. It’s not actually called Mountain Song, I just remembered it being something about hill or mountain or song. After an extensive search, I actually found the movie. It’s called “Shan Ge Lian” or The Shepherd Girl. Made in 1965. 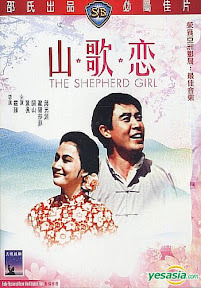 In this Chinese romantic melodrama, a young shepherdess falls in love with a boatman but cannot marry him as her father, a compulsive gambler, is deeply in debt. Another man offers to pay all of her father’s bills if only she will marry him. She demurs, but then she sees the boatman acting kindly towards another woman and gets jealous. To get even, she begins cozying up to her potential benefactor. Fortunately, a helpful widow intervenes and tells her that she misunderstood what she saw. Later the brave boatman goes to sea to earn enough money to pay off the debts. Unfortunately he is gone so long that the poor girl thinks he has died. She finally agrees to marry the patient benefactor. As the wedding ceremony begins, the boatman finally returns. He then fights the other man and ends up kidnapping the girl. Romantic bliss ensues. Here is an excerpt from youtube posted by a Thai. It is really the world wide web. The web stretches across time, culture, language, nationality, and even obscure stuff from “ancient” times. The professors and grad students had a baby shower for my professor, Dr K, who is adopting a 3.5-year-old girl from China. During the baby shower gift opening time, I sat through a 30-minute Introduction to the Best Children’s Books 101. The professors in the college of education gave the most acclaimed children’s books. The professors also gushed over some of the books and how their own children wanted their moms to read those books to them over and over again. And that got me thinking…hmmm, I don’t remember my parents ever reading to me when I was young. Maybe I was too young to remember. But I think, they were probably too busy putting bread on the table. We did, however, have lots of books. And there were not ordinary children’s books, we had sets of different children’s encyclopedia and TIME-LIFE books. That’s because my dad used to work for the only company that sold Encyclopedia Brittanica in Malaysia. However, my most vivid memories of my early childhood are not of books. I most vividly remember the Chinese videos that my babysitter used to let me watch. I must have watched those videos many many many times and developed many dedicated long term memory neurons to those stories. This story took place in rural China. Once a year, the young men and women would go up to the mountains and have some sort of singing-find-a-partner festival. The guys would sing something. The girls would sing something. Occasionally, one guy would sing something witty and another girl would reply with something wittier. And when the guy finally outwitted the girl, the blushing girl would run off, and the guy would run after her. And that’s what happened with the two protagonists, Ah Lian and Ah Kong. They were the wittiest and most handsome couple. Ah Lian, however, was very poor. Her dad, owed the village bully, Bully Loong, lots of money. In order to marry her, Ah Kong had to make the difficult decision of sailing down the dangerous Yellow or Yangtze river to find his fortune to repay Ah Loong. Ah Lian was devastated. Every day, she would go to a lookout area up the hill and wait for Ah Kong to come back. But he never came back, and finally the deadline to repay the debt came, and Ah Lian’s father had to agree to give Ah Lian in marriage to Bully Loong. On the day of the wedding, the marriage procession made its way to Ah Lian’s house and on the way back to Bully Loong’s house, Ah Kong appeared. Ah Kong looked beat up from the long and dangerous journey. Ah Lian was ecstatic. Bully Loong was mad. Bully Loong refused to give up his bride, so Ah Kong fought with Bully Loong. Eventually, Ah Kong won the fight and got Ah Lian back. This story was about the prettiest maiden in town, Miss Beautiful, and her handmaiden. Some rich guy married Miss Beautiful and they were about to live happily ever after. But unbeknownst to him, his wife and her handmaiden were snake ladies. Occasionally, they would change into snakes. Anyway, one suspecting person tried to prove that the ladies were snake ladies. He tried to splash sulphur on the ladies. His plot was successful and the husband found out the truth. But I can’t remember what happened after that. Once upon a time, there was this evil Emperor who fell in love with the most beautiful woman in China. He forced her to become his empress. The Empress, however, hated the emperor and was in love with one of the palace guys. The Empress then tricked the Emperor to build her the tallest tower in all of China. The Emperor was so enamored by the Empress, he quickly began to have that tower built. But building that tower caused much misery to the common people. Towards the end of the movie, the Empress tricked the Emperor to the top of the tower, got him drunk and then she set fire to the tower. The Emperor died, but she was rescued by the guy she loved. However, I think she had severe injury and died in the end. Well, those are my most vivid early childhood memories, not of books, but of old chinese dramas…hahaha. The PM is supposed to hear the voice of ALL Malaysians, regardless of race. It is MORALLY WRONG for the PM to say that the Government will ignore groups of Malaysians for the next four years if these people choose not to vote for BN. The Members of Parliament and State Assembly are elected to represent and serve ALL Malaysians in their respective constituencies. It’s their duty. These elected leaders are ultimately accountable to the people. Indelible ink will leave no mark…. Some time ago, I was talking to my mom about the use of indelible ink in the coming general election in Malaysia. Although in the local newspaper, the Election Commission (EC) said that they’ve done the calculations and enough bottles of ink have arrived and each polling station will have enough supply of the indelible ink, I said to her that I’m pretty sure that the EC will mess it up by not supplying enough ink. The polling station people will inevitably spill some of the ink or some of the bottles of ink would have dried up during the long journey from India to Malaysia. In other words, the use of indelible ink will be kelam-kabut (chaotic). The chaos that I imagined will be due to the lack of experience. In the end some people will not be marked because the ink has ran out…I can live with that. At least the EC is fulfilling one of the demands of BERSIH. I never imagined that the EC will purposefully not supply enough ink so that “Phantom Menace” and “Attack of the Clones” could take place. That’s just too well planned and sinister…. Then four days before the general election, the EC throws us a curve ball: the use of indelible ink has been canceled. Who are these irresponsible quarters?? Which quarters seek to gain from the cancellation of the use of indelible ink? Definitely not the opposition. “The EC views these issues seriously as the election process and public order and security cannot be compromised,” he said. I guess the EC will not compromise “public order and security” but they have no issues with trampling on a clean and fair election process. There’s something so sinister about this whole election process. It is widely known that the EC has been carving constituencies to benefit the ruling government. I mean, I know that it hasn’t been clean and fair but I used to think the chaos on the election day itself (i.e., messy electoral, occasional cloning, etc) is similar to the chaos of the public transportation system in Penang. Now I see that the chaos is just a veil: real planning and many strategic decisions have been made by the Ministry of Sinister Affairs to ensure a non-BERSIH election. This is so sad and disappointing. I was never much of a gamer. When I was around 10, I was “tricked” by my brothers to pitch in my CNY angpow money so that “we” could get a Sinclair ZX Spectrum computer. I think I ended up playing only about 1% of the time. This year, just before my birthday, my brother introduced me to the Patapon online demo and the Playstation Portable (PSP: the only platform that plays Patapon). Before long, I’m totally sucked into this PSP/Patapon craze and the PSP became a must-have item. I still don’t really know why I had to get it. For a while, I’ve been thinking of saving some money to get a videocamera for my dissertation research. But now that I’m in the midst of writing up the research proposal, I’m sort of sick of doing everything and thinking about the research proposal all the time. I didn’t want to get a work-gift for my birthday. At the same time, I wanted something “fun” to soothe my one-third-life crisis. So I got the PSP for my birthday. The PSP also plays music. So once again, I could actually have music while driving without having to fix the “locked” stereo player in the car. No Patapon?!! Then the PSP is only 1/3 the fun. So I tried to download the demo. Unfortunately, the demo is not downloadable to a Mac. So I went down to a PC in the computer lab and tried to download it there. But, I couldn’t get the installer to work because I didn’t have administrator rights on the PC in the lab. I’ve already contributed my share of helping out the US economy and done enough damage to my own pocket. No more spending money to get a case for the PSP. I found this bottle cooler sleeve that I got at the Women’s 5K Classic expo. I think it works fine.